What is the bird-window collision problem? Hundreds of avian window collision victims are admitted to the Wisconsin Humane Society's wildlife rehabilitation hospital each year and it is estimated that between 300,000,000 to 900,000,000 birds die each year in North America from building collisions alone! Navigating near and around glass is a foreign concept for birds (no non-manmade substance functions like glass quite in the same way) and when they encounter it, birds either become exhausted and disoriented attempting to navigate around it, they try to “fly through” the landscape reflection that they see in the glass (meaning that they can’t “see” or “understand” the glass until it is too late), or in the case of aligned windows on buildings, glass-enclosed skywalks/walkways, and corners – they may try to fly through the “tunnel” to gain access to the other side. These birds already face a wide variety of threats, including habitat destruction here and on their wintering grounds in Central and South America. With so many challenges already facing these birds, it is vital that we help to make our communities safe for the many thousands of migrating birds that pass through our area in the spring and fall, as well as the resident birds who are with us all year long. Approach the bird slowly and quietly, ideally from behind, and capture it with your hands by gently grasping it around the body from behind. Caution: while most small birds have weak bills and feet and are not capable of biting or grasping very hard, some large-billed songbirds like Northern Cardinals, Rose-breasted Grosbeaks, and American Crows CAN bite pretty hard. It is recommended that you wear a pair of lightweight leather gloves when capturing these, and small birds of prey like Eastern Screech Owls and American Kestrels. For guidelines for capturing larger birds such as ducks, geese, and larger birds of prey, see below. Cover the bird with a cloth, and use the cloth to pick it up. Gently scoop the bird into, or cover with, a cardboard box. Capture the bird by placing a fine-mesh net such as a butterfly net or swimming pool skimmer net over it. With the bird still inside the net, pinch the net to keep the bird from escaping, and then reach in to grasp the bird by and and transfer it to a box, paper bag, or other suitable container. Don’t try to lift up an edge of the net to slip your hand underneath it; lifting the edge of the net will give the bird a chance to escape. 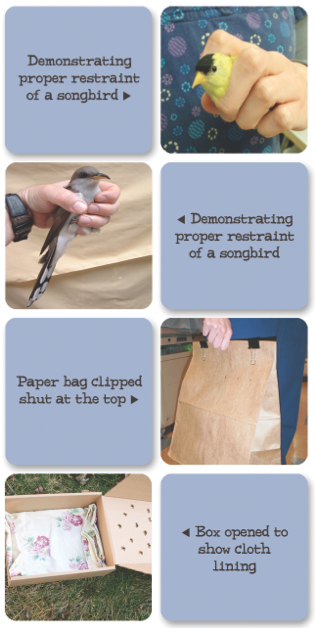 Once captured, place the bird in a box or paper grocery bag that has small, pencil-sized air holes poked through the side and/or top. Include a ravel-free cloth (pillow case or T-shirt), paper towels, or newspaper on the floor of the container. Close the container securely and place it in a dark, quiet, warm place where it will be undisturbed (keep children and pets away) for about an hour. After an hour, open the container outdoors. If the bird comes out and flies away, it has recovered. If it does not fly, flies weakly, falls over, flies in circles, or otherwise appears to be injured, close the container or recapture the bird and call your local wildlife rehabilitator. If you are in Milwaukee County, please call us for further advice at (414) 431-6204. You should be very careful when trying to capture/contain any of these birds. Some have sharp talons and others have sharp or powerful bills. They use these “weapons” to defend themselves from predators, and they don’t know that you are trying to help them. When attempting to contain any bird that has a long, sharp bill (e.g. a heron or crane) you should wear safety glasses or a plastic face shield to protect your eyes. These birds defend themselves by jabbing with their bill, often at their “attacker’s” face. Ideally, these birds are then contained by holding a large blanket or bed sheet open in front of you and using it to drape completely over the bird. For any bird that has sharp talons (e.g. a hawk or owl) you should wear thick leather gloves, ideally, welding-type gloves with gauntlets that protect your forearms. However, these birds may still be able to penetrate the gloves with their talons, so don’t try to grab these birds directly by hand. Instead, for these and any other larger bird such as a duck or goose, cover the bird with a sheet or blanket, or use an empty box. After covering the bird with the box, gently slide a flat piece of cardboard or similar rigid material under the bird to contain it in the box. You’ll then need to tape or tie the box to the flat piece of cardboard to make sure the bird can’t get out of the box. Stressors such as loud noises, talking, excessive handling, or the close proximity of pets or people can create life-threatening stress for the bird. You should minimize stress by not playing your car radio during transport and by keeping talking and other noise to a minimum. Do not needlessly look in on the contained bird. Do not give it food, water, or medication unless you are directed to do so by a licensed wildlife rehabilitator. Get the bird to a licensed wildlife rehabilitator AS SOON AS POSSIBLE. Once an animal is injured, the clock is ticking. The sooner an animal gets to a licensed wildlife rehabilitator for treatment, the better the chances for a good outcome. 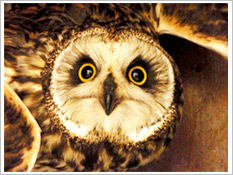 By law, you have a 24-hour grace-period in which to get the captured bird to a licensed wildlife rehabilitator. To keep birds from seeing in one window and out another window, simply close the blinds or curtains on one of the windows. Without obscuring the window, birds often think they can fly through these "tunnels" and are injured or killed as a result. Hang brightly colored fluttering ribbons, such as Irritape holographic Mylar tape, in front of windows. Hang vertical strips of parachute cord, such as Acopian BirdSavers, in front of your windows. Or, tie unwanted compact disks (CDs) hanging on string in front of the window so that they turn in the wind. Install fine-mesh plastic netting in front of windows. Leave a few inches between the glass and the netting to allow birds to collide softly with the mesh instead of hitting the glass. Emilinate reflections completely by applying CollidEscape® film to the outside of windows. Reduce the risk of window collisions for birds visiting your feeders by placing them either very close (within three feet) or at least ten yards away from windows. Lower window awnings to shade your windows and reduce reflections. Utilizing motion detectors to control lights when lighting is necessary. Scheduling night cleaning to reduce the amount of time lights are needed. Programming light timers to fit hours of operation and cleaning. At night, move activities requiring light to interior rooms or use low-intensity task lighting like desk lamps. For specific areas where birds collide during the daytime with windows on the bottom 3-4 stories of your building, you can install CollidEscape®, Bird Screens®, WindowAlerts® or other treatments to reduce collisions. To view a list of bird-safe businesses in our community, visit our gallery here. If you are taking action at your business to reduce the risk of birds colliding with your windows, you may qualify to be designated as a “WIngs BirdSafe Business.” The application process is very easy and only takes a few minutes. Complete the form by clicking here. Is your company considering constructing a new building or planning to renovate an existing building? Please help keep wild birds safe by incorporating “bird-friendly building design” into your plans! Learn more about bird-friendly building design from the American Bird Conservancy. You can also view and download their Bird-friendly Building Design Guide. For more information on how you can make your business safe for birds, contact WHS Wildlife Director, Scott Diehl, at sdiehl@wihumane.org. Take action to reduce bird collisions at your school or campus! We encourage you to coordinate with teachers, administrators, building support staff and other students to make the biggest impact. Become a Bird Collision Monitor at your school or in Downtown Milwaukee. Bird Collision Monitors check near campus buildings during migration periods to search for and rescue or recover window collision victims. Monitoring can help save injured birds; it gives you an opportunity to participate in citizen-science, and can help alert school officials to the need for window-collision prevention on campus. Be an advocate for bird window collision awareness and action on campus: post flyers, write newsletter articles and blog entries, and make collision monitoring a service project for your on-campus club. Treat your own home, dorm, classroom, campus, and school/office windows to help prevent bird collisions. Incorporate the window collision issue and the citizen-science of WIngs Bird Collision Monitoring into your classroom or lecture hall. For more information or assistance, contact WHS Wildlife Director, Scott Diehl, at sdiehl@wihumane.org. Become a seasonal WIngs (Wisconsin Night Guardian for Songbirds) Bird Collision Monitor during peak migration season. Large cities are dangerous for migratory birds and they need your help! Migratory birds are seriously disoriented by reflections on glass and mirrored window surfaces, glass walkways, and bright lights that illuminate the night sky. That's where WIngs (Wisconsin Night Guardian for Songbirds) Bird Collision Monitors play a role, and step in to rescue these fallen birds. Bird Collision monitors patrol areas of downtown Milwaukee in the early morning hours during periods of peak migration (Spring: May; Fall: September and October). Injured birds are then transported to the Wisconsin Humane Society Wildlife Rehabilitation Center for immediate, life-saving care. Additionally, data collected from monitoring helps us understand the window collision problem in Milwaukee. We will fully train you on how to properly rescue these birds. You must be an adult to participate and are encouraged to volunteer with another adult. If you are interested in volunteering as a WIngs Bird Collision Monitor, please email the Wildlife Supervisor at csharlow@wihumane.org.